A few days ago, OpenFlights reached 50,000 flights, so it’s a good time to take a look at how that mass of data is shaping up. 7 Boston-General Edward Lawrence Logan (BOS) ? Much more scattershot results, this time comparing against Airports Council International. The big surprises are that world #1, Atlanta-Hartsfield (ATL), only makes it to #12 on the OpenFlights list, and world #4 Tokyo-Haneda (HND), almost entirely domestic, doesn’t even make it into the top 100 on OpenFlights (we obviously need a Japanese version!). The effects of airline popularity are also visible: not-too-popular Air France pushes world #5 Paris-CDG down to #16, while Lufthansa powers both Frankfurt and Munich to a disporportionately high rank. At this early stage, it’s clear that regional popularity and even individual users can distort the stats quite a bit. However, as the flights accumulate, the database should start to more and more closely resemble the real world, and this will also open up the possibility of introducing all sorts of neat features. Enter a flight number, and we’ll already know what route it represents; pick an airline, and we’ll show you its entire network; select an airport or two, and we can tell you what flights exist (or existed) between them. Stay tuned for our next update at 100k! This has been one of the top feature requests since day 1, and we’re delighted to announce that OpenFlights now has a Facebook application! Install the app and give it your OpenFlights username, and something very similar to what you see on the right will appear, showing the number, total distance and total duration of your flights. Click on the map or any of the links, and it will pop up your full OpenFlights profile. What better way to share your travels? What else would you like to see on Facebook? Join the discussion on the application’s About page, and while you’re at it, join the Facebook fan club as well. OpenFlights was originally created as a personal flight mapper, so you can record your own flights and share them with the world. However, our inventive users have come up with some entirely different things to do with the site, and I’d like to share a few of them today. Over at FlyerTalk, the frequent-flyer website extraordinaire, there are dozens of “Dos”, or get-togethers, in cities all over the world every year. These involve people flying in from cities all over the world for a weekend or so, all on different days and different flights, and then dispersing the same way. How to find out who else is coming from the same direction, on what flights and when? For the fourth Continental Do (Feb 6-7, Houston, Texas), sbm12 had a brilliant idea: let every participant list their own flights on OpenFlights under CODoIV. Want to figure out who’s coming in from Philadelphia? One click and you’ll find out. The same idea would work nicely for conferences, weddings or any other larger event, private or public, and as plans change, everybody can change their own flights, with no need for a central coordinator. Texas is famously big, and the Office of the Governor wanted to show visitors just how many international connections its airports have. What better way to show this than mapping them on OpenFlights as DFW_International? Given the care lavished on flight maps in inflight magazines, it’s surprising how bad the online route maps of most airlines are. One way to address this is to create a profile on OpenFlights, like GAflight‘s listing of all Garuda Indonesia routes, past and present. Any other fun or useful ways to use OpenFlights? Let us know. OpenFlights has a dynamic map. You can pan, zoom, select, scroll and explore all you like! OpenFlights is user-friendly and efficient. Everything’s on the same page! OpenFlights makes searching really easy. Point and click! OpenFlights has a powerful filter. Three clicks, and your map will show only Singapore Airlines flights in business class in 2007. OpenFlights works in realtime. Make any change, and you’ll see it right then and there. 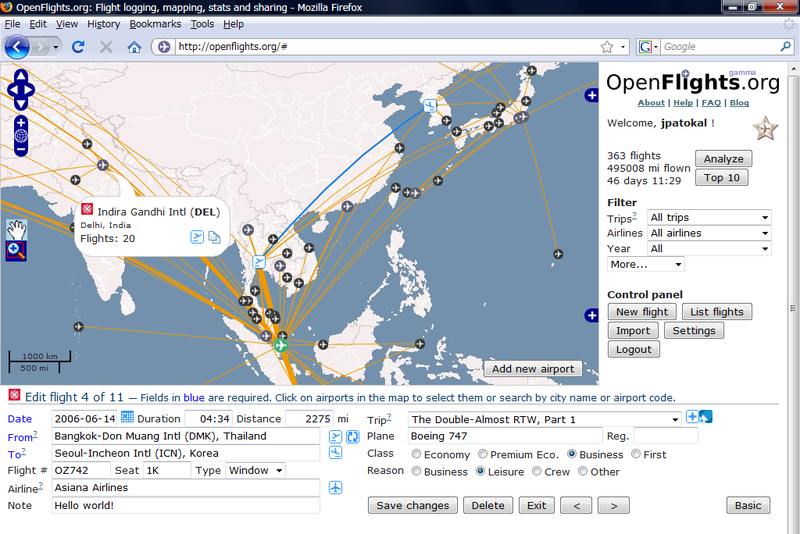 OpenFlights supports “trips” (read more). You can join up any flights together into a trip, which you can then display on its own page and even share with friends. OpenFlights is free in spirit. We don’t try to lock you in: it’s easy to import your data and export copies for safekeeping. OpenFlights is free software. All our source code and (public) data is licensed under the GNU Affero General Public License and can be downloaded from SourceForge, so you can set up your own copy or just use the bits you like. OpenFlights can be used anywhere. No need to install any programs, synchronize data or take care of backups, just point your browser to the site. Today also marks the introduction of our Elite Level system, in which those users who have contributed to the site, either through beta-testing, publicity or donations, receive stars on their profile and access to a few extra perks like password-protected private profiles and opting out of advertising. On the other side, those users who have either entered over 100 flights or set their profiles as private, meaning that they are not visible to the outside world, will start getting reminders to consider contributing. However, all core functionality in OpenFlights is and will remain free to all. This is by no means the end of new development for OpenFlights, there are plenty of feature requests already waiting for us to get back to work. Your feedback on what you’d like to see next is very welcome! Categories: Announcements, Uncategorized | Permalink.